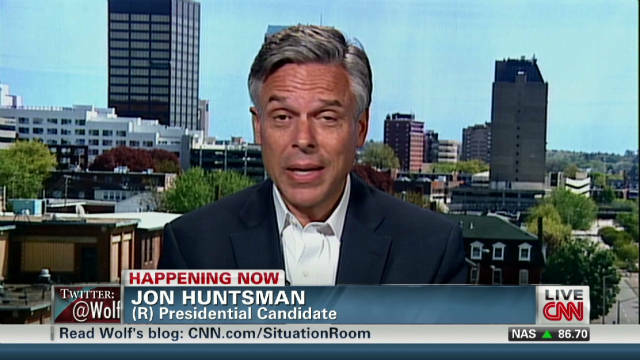 By Candy Crowley, host of CNN's "State of the Union"
Romney's faith an issue in GOP race? Washington (CNN) -- Thomas Jefferson famously wrote about the wall of separation between church and state. He didn't mention separating church and politics, but everybody knows it's a sticky wicket. On Friday, Robert Jeffress, a Southern Baptist minister, introduced Texas Gov. Rick Perry at at a gathering of social conservatives, calling Perry a genuine follower of Jesus Christ, as opposed to another candidate Jeffress could and did mention in a later interview. "I think Mitt Romney is a good, moral man, but I think those of us who are born-again followers of Christ should always prefer a competent Christian to a competent non-Christian like Mitt Romney," Jeffress told CNN's Jim Acosta. Read more: Perry's minister problem? 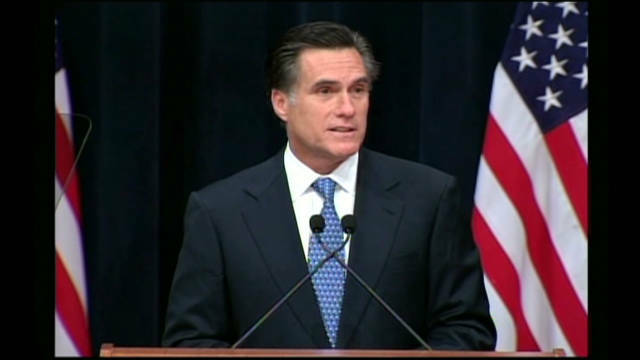 Romney is a Mormon and he has passed this way before: Four years ago, the first time he ran for president, he made a speech to address concerns, rumors, and political analysis of his religion in a speech. "I believe in my Mormon faith and I endeavor to live by it. Some believe that such a confession of my faith will sink my candidacy. If they're right, so be it." 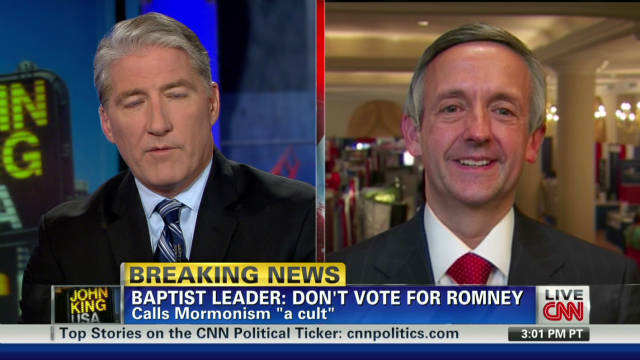 Pastor: Romney's Mormon faith a "cult"
Asked about the controversy on CNN's "State of the Union" on Sunday, Romney's Republican presidential rivals took a pass. "I'm not running for theologian in chief," businessman Herman Cain said. "I'm a lifelong Christian, and what that means is one of my guiding principles for the decisions I made is I start with, do the right thing. I'm not getting into that controversy." 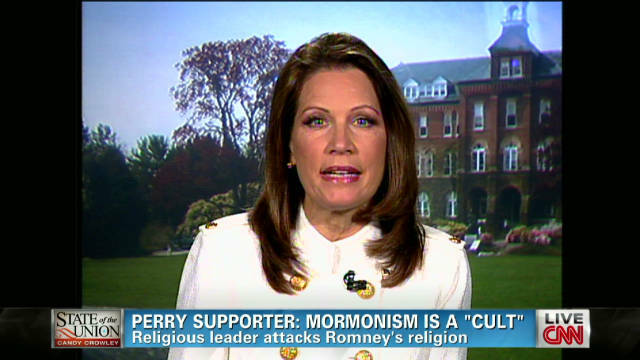 Minnesota Rep. Michele Bachmann called the issue "so inconsequential." Asked if she was concerned that people might think she was dodging the question, Bachmann said, "I think, again, to make this a big issue is just ridiculous right now, because every day I'm on the street talking to people. This is not what people are talking about." Asked the same question, Cain had a similar answer. "If that's what it looks like, I'm dodging it, because it's not going to help us boost this economy, and you know that that's my No. 1 priority," he said. Many things sank Romney's candidacy in 2008. Religion may have been one of them. 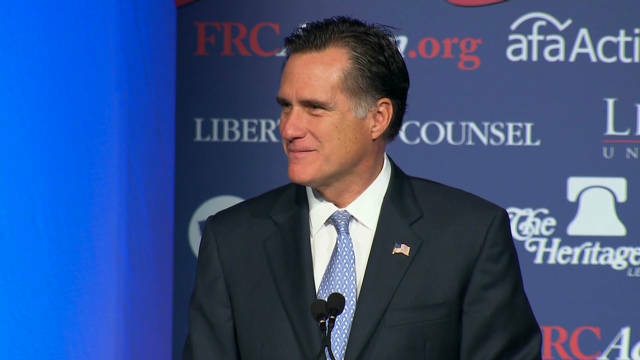 Ron Brownstein, editorial director of the National Journal, points out that Romney ran poorly among evangelical Christians, especially in the South, in 2008. "In all the Southern states, he never topped out above 20% of the votes among evangelical Christians; only 11% in the critical state of South Carolina," Brownstein said. In all, 45% of Republicans who vote in primaries are conservative evangelical Christians. They are far less a factor in a general election. For Romney's rivals, this requires straddling a line -- you don't want to alienate a huge part of the primary vote, nor do you want to look intolerant.